Finish. It’s what the United States Women’s National Team needed to do to secure a 5-1 win against continental rival Mexico Sunday night at Stub Hub Center in Los Angeles, CA in front of a sold-out crowd of 27,000. After entering the locker room at the half with the score tied 1-1, some may have started to worry. The USWNT controlled most of the game. They had the possession. They had the confidence. They had the playmaking. They had an incredible amount of chances and missed opportunities including a header off the crossbar, a wide open net with Mexican keeper, Cecilia Santiago, out of position and a sequence of blocked shots in the 14th minute that left fans scratching their heads after no goal came from it (it was an unreal effort by Santiago and her defense to not let any shots get through). They stepped off the gas slightly for a few minutes and had a few lapses in decision making. It lead to a Mexican goal off a free kick from a dangerous area left of the 18 yard box. The only U.S. goal came in the 28th minute off a great run from Sydney Leroux who converted a Megan Rapinoe through ball from a sharp left angle. In the first half, the USWNT had almost everything. All they needed to do was finish. When they came back out for the next forty-five, that’s what they did. The attack started promptly in the opening minute when halftime sub Abby Wambach reached a deflected ball and passed it back to fellow halftime sub Lori Chalupny who sent the ball past a diving Santiago near post for the game’s second tally. In the 58th minute Mexican defender Arianna Romero tried to clear a U.S. corner that deflected off her outstretched hand resulting in a penalty. Wambach converted the ensuing PK to give the U.S. a 3-1 edge. The fourth goal came three minutes later off another great run by Leroux who took a touch around Santiago and sent a shot from the right side into the back netting. 4-1 USA. No big deal. It made the 1-1 score at the half seem laughable, but they weren’t finished yet. In what was the play of the entire match, Tobin Heath, who entered the game for Lauren Holiday at the 62nd minute mark, used a sick, ankle-breaking cut move to leave a Mexican defender in the dust near the end line and sent a cross to the far post where Wambach finished it with her head. It happened in the 72nd minute. Even though the goal was Abby’s for the taking, the move by Heath brought fans to their feet. Heath made the whole play happen. It was an incredible show of talent and skill by the midfielder. 5-1 USA. Finished. This match was exciting from the start. Despite the halftime score, the USA had the opportunities. In the second half they were able to convert those opportunities. It was a thrilling performance by a talent group of soccer players. I could argue that the USWNT is the most exciting soccer team to watch out of any soccer team in the entire world, men’s and women’s teams combined. I think that’s what captivated me back in 2011. The women’s game was so exciting. Just the other day before the match, I was reflecting on how I like watching women’s professional soccer now (especially the USWNT) and how I distinctly remember at one point in my life thinking soccer was the only professional major team sport I’d never get into. Of course at the time I think I may have been flicking through the channels on TV and caught a glimpse of men’s game. So in a way, I was partially right. I’m really not into men’s soccer. I just didn’t realize I would/could fall for the women’s game. 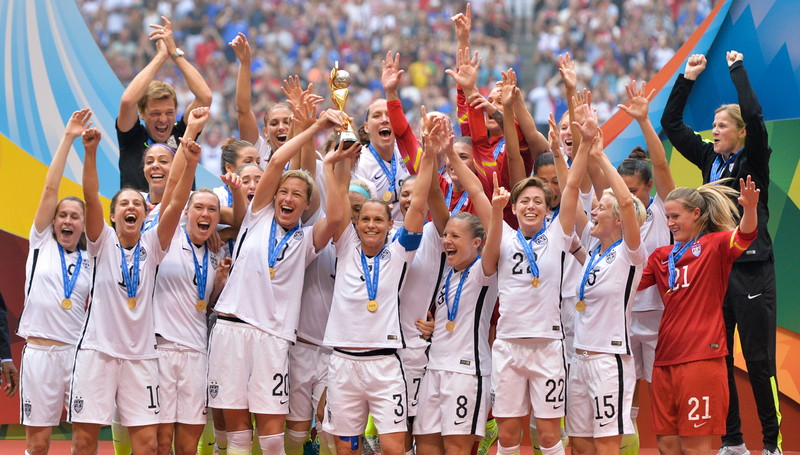 As the start of the 2015 Women’s World Cup rapidly approaches (19 days say whaaaat?! ), another player from the U.S. squad to watch out for is Sydney Leroux. After a slow start to the year because of an injury and lack of playing time, Leroux made it known in last evening’s match that she’ll be an attacking threat for the United States this summer in Canada. Her speed, tenacity, and skill as a forward make her a weapon for the U.S. Not to mention, she’s half Canadian and will no doubt be the recipient of some taunting by Canadian fans, who consider her a traitor to the nation. Leroux’s mother is Canadian and her father is American which gave her the privilege to play for the U.S. Soccer program through her youth and professional career despite being born in Canada. I’m sure she’ll use whatever harassment she receives next month to motivate her to the fullest because that’s the kind of determined player and person she is. She really is a force to be reckoned with. Then again, the United States is loaded with them. They have everything they need to go all the way to lift the coveted World Cup trophy. All they need to do is finish.